If you’re a reader and a casino fan, there 5 books are good reads. But, if you’re a gambler and you want to improve your gambling skills, then these books are a must. Some of these books are actual autobiographies, some are biographies and some are fictional but with a lot of research done on the subject. Nevertheless, you will learn a lot about gambling, the life of gamblers and most importantly, the tips of real pro gamblers. If reading is not your strongest suit but you’re still interested to know what this number one gambling book is about, you can watch the equally popular movie. It is actually quite an interesting book that narrates the true story of a group of MIT students that decided to bring down the house by counting cards in blackjack. Thanks to their brilliant, genius minds and exceptional MIT math skills and knowledge, they started training as a card-counting team, with the sole aim of winning over the house and make millions, which they eventually did. 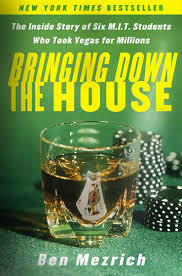 This book is more of a beginner’s guide to the casino games strategies. However, the author supposes that you have a previous knowledge of at least the basic rules of the games and gradually teaches you how to improve your odds of winning. The author is a statistics and mathematics expert analyst, so the book is based on real statistics made over years of study and experience. Essentially, you will learn about the house edges and the best strategies that can be used for winning at online casinos. Although quite an old book, Beat the Dealer is definitely not a book to be underestimated as it is actually the first book that proved the ancient myth – that you can use card-counting to win over the house. As a mathematician, Edward O. Thorp proved that mathematically speaking card-counting is real. In fact, the entire book is scientific, with equations, charts and all, and it served as the beginning of the card-counting movement, inspiring many authors to keep digging into it. Michael Craig did a fascinating job in capturing the world of the high-rollers, the huge bets and the lavish lifestyle of big-time gamblers. It actually tells the story of a billionaire banker Andy Beal, determined to beat the most skilled poker players at their own game of choice. With detailed descriptions about the secrets of the poker strategies, Craig skilfully combined a good story with a useful gambling material. You must have heard about the World Series of Poker, but do you know the true story about its creator, the mob boss and casino owner Benny Binion? Well, if you're interested in having a peek into the world of mobsters and their notorious lifestyle, you must read this book, with a gangster movie dynamics.